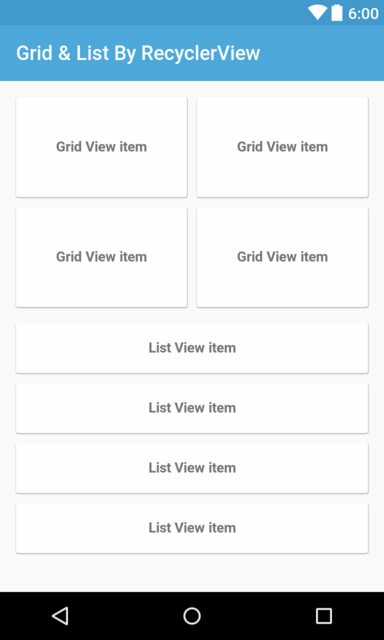 As you can read at my previous post, if you use GridView to build a grid layout and ListView to make a list layout in Android, putting these 2 widgets into a single screen is not easy, my solution is making a custom GridView which expanding it's full height and set it as the ListView's header later. But now, Google has released RecyclerView - the successor of 2 old widgets (ListView and GridView), we can build this design easily because of it's own scroll and reuse mechanism. Now, take a few time to read some important steps in this "combining work"! //set layout manager and adapter for "ListView"
//set layout manager and adapter for "GridView"
As you can see on the code above, RecyclerView can be put in ScrollView or NestedScrollView, which ListView/GridView cannot do. During work, as a Android developer, you should pay attention to the update features from Google to deal with the topic that problematic formerly. Through this post, I hope you can understand more about using RecyclerView in building list interface. Finally, you can take full code be click the button below!